born in Catalonia; died 1492; author of a work treating of the eternity of the world, Providence, prophecy, immortality, and the resurrection, and also dealing with mathematical, physical, and cabalistic subjects. It appeared under the title "Neweh Shalom" (Dwelling of Peace), Constantinople, 1538; Venice, 1574, with a preface by Moses Almosnino, who cites it several times in his work, "Me'ammeẓ Koaḥ." 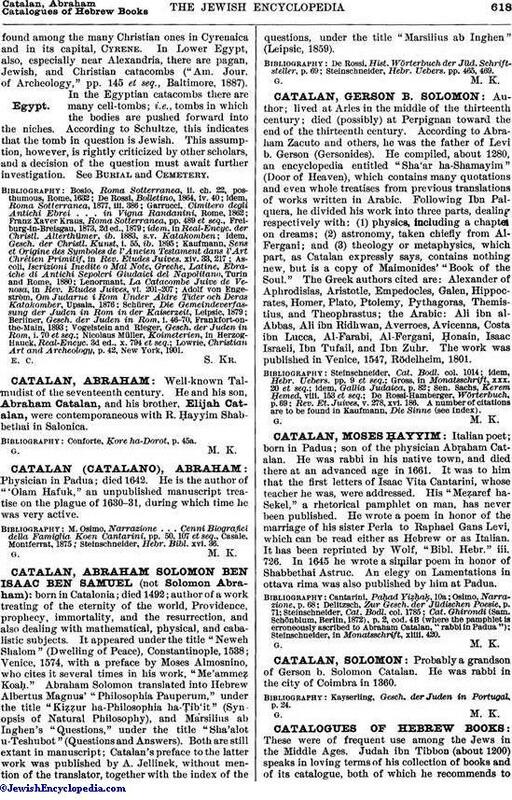 Abraham Solomon translated into Hebrew Albertus Magnus' "Philosophia Pauperum," under the title "Kiẓẓur ha-Philosophia ha-Ṭib'it" (Synopsis of Natural Philosophy), and Marsilius ab Inghen's "Questions," under the title "Sha'alot u-Teshubot" (Questions and Answers). Both are still extant in manuscript; Catalan's preface to the latter work was published by A. Jellinek, without mention of the translator, together with the index of the questions, under the title "Marsilius ab Inghen" (Leipsic, 1859). Steinschneider, Hebr. Uebers. pp. 465, 469.